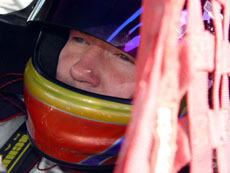 Triple Crown Racing has announced the signing of veteran Busch North Series driver Eddie MacDonald to be in the seat for the 2005 racing season. Team owner Jerry Morello has secured the services of Rollie Lachance to handle the crew chief duties. eries. He just knows all the specific things a team needs to do to be successful." MacDonald also brings a great deal of experience to the table with a reputation for getting the most out of the equipment he is driving. He has had some success on the tour but states, "It is time to get back into victory lane, it has been too long. Joining this team is awesome and it gives us an excellent chance to be competitive this year with all the great teams." The goals of the team are simple according to MacDonald, "We want to run in the top five consistently and we want to win a race, or two, or three. I really believe that with Jerry, Rollie, and the returning crew we have the oppurtunity to run up front all year." The team is busy at work building new cars for the season while Morello is having the motors built down south. "It may take a little time for everyone to get totally used to one another but things are going great so far and everyone is really excited about the season," said MacDonald. Eddie MacDonald will have a new racign home in 2005. MacDonald, in his fifth year in the series, is excited to step into an established program and looks at the upcoming season with great expectations saying, "This team has so much experience with Jerry who has been a team owner for seven years in the modified series before joining our tour. Jerry is the type of owner who does what it takes to win and his leadership will lessen the problems and worries on me so I can just concentrate on driving."